Lucia drove all the way out here from Oakland because she wanted to be with me at her home and with the grandchildren on Tuesday morning for Obama’s first Inauguration. We watched the Lincoln Memorial on her lap top – a wonderful show and cried tears of happiness, especially for me when I heard Pete Seeger sing. Did you know that man has played an important role in my life since I first heard him in 1948 at the Progressive Party convention in Philadelphia when Henry Wallace was running on a Progressive Party ticket for president against Harry Truman? I once heard Seeger introduced as the only human being who would sing and talk at the same time. Attached is a bit I wrote on Pete Seeger. Please note: It was written after watching Obama’s first inauguration. 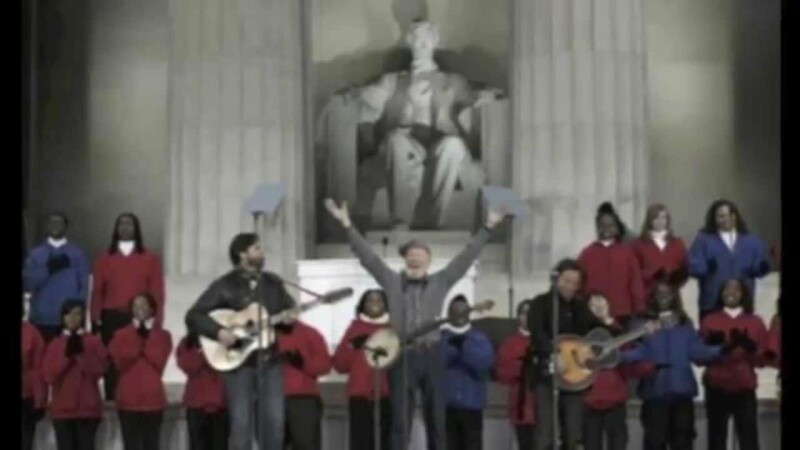 Three generations of Pete Seeger memories came rushing to eighty year old me as I watched three generations of singers: Pete, Bruce Springsteen and Tao Seeger sing at the Lincoln Memorial the Monday before Obama’s Inauguration. Then In the early 50’s, Sen. Joe McCarthy started a vendetta against anyone even the slightest liberal labeling them “Communists”, “Reds”, traitors. Pete was among the many entertainers who were black listed because he refused to testify before McCarthy’s committee. Consequently, Pete’s venues were cancelled, records were taken off the air and finding new venues was pretty near impossible. One time Pete gave us parents an adult only concert with Blues singer, Big Bill Broonzy . Broonzy’s signature song was: ‘If you’s white, you’s alright,/ if you’s brown, stick around/ but if you’s black, get back, get back get back’). Broonzy, six and half feet tall, very black, played a 12 string steel guitar. After the concert we went our leftist friend’s home and stayed up all night listening to Seeger and Broonzy swap songs. Pete’s first public concert, in the late 1950’s after McCarthy days, was right there in Hyde Park, that “hot bed of red communism”, the University of Chicago. Seeger kept giving encore after encore to an SRO house. When it came time to close Mandel Concert Hall, he led the entire audience out into a cold April day, all of us laying down our swords and shield, “Down by the Riverside”. We continued singing, bundled up on the steps of Mandel Hall until we froze up and decided to go home. There followed concerts at orchestra hall, the phenomenal Weavers Reunion at Carnegie Hall. Both Seeger and the Weavers were back in the limelight. In the late 1970’s, I saw Pete perform at the gym at Sonoma State University where I was re-entry student. A small child started crying, Pete stopped singing, walked down the aisle to the mother and child, sang a lullaby and the child went to sleep. He then returned to his presentation. He sang at Berkeley High at Malvina Reynold’s memorial services singing Reynold’s songs and many of his own. Later, I took Lucia, my youngest daughter, who’d somehow never managed to see him (She had the flu or measles or something) to hear him sing with his grandson at Berkeley High. Then there was the time our whole family went to hear the Weaver’s Reunion at the Greek Theatre in Berkeley. “That side was made for you and me. “Is this land made for you and me? When I look back over sixty-five years of hearing Pete Seeger’s voice of hope, of love, of compassion, I wonder if Pete isn’t an incarnation of Elijah, reappearing to bring peace to the world.